Now that you have determined which features you want, the Fireside21 innovation can begin! Over the next few months, our team will begin a comprehensive development process to create the final four features. First, they will investigate the winners and interview users to determine how people would expect the features to work. After determining the scope, our team will prototype the features and, eventually, test the functionality within the emanager. Once the features have been built and successfully tested, it will be time to deploy the features to everyone. 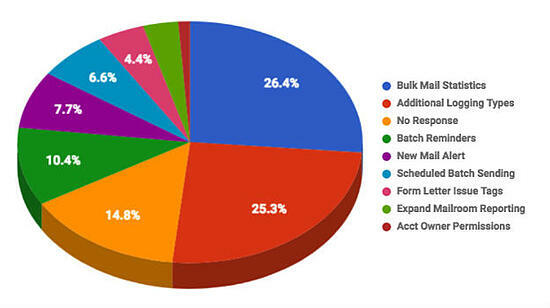 That's the beauty of Feature Frenzy: you vote, we code. In addition to these winning features, our developers have crafted a robust product roadmap based on our own goals and ideas, as well as previous customer feedback. 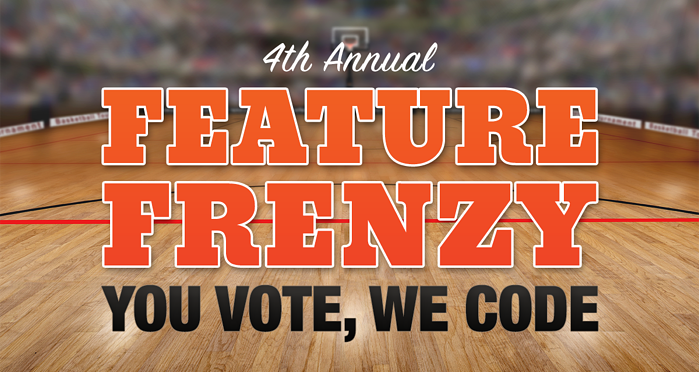 You are definitely going to see more than the Feature Frenzy Final Four winners over the next 12 months. If you want to read more about the Frenzy or the previous winning features, check out our blogs for 2015, 2016 and 2017. For now, let’s take a closer look at which features were your favorites! For the 2018 Frenzy, the Casework competition was a bit of an upset. 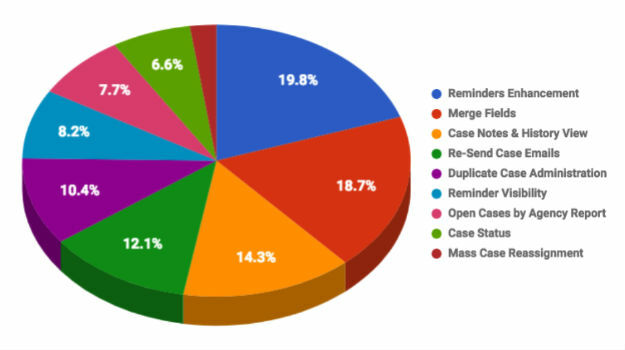 The 2nd and 3rd place features from 2017 (Open Cases by Agency, Case Status) were expected to be frontrunners. Instead, this year, Reminders Enhancement and Merge Fields were the two features that would prove to be most popular for Fireside Users. Throughout the week of voting, each would take a turn in the lead. However, like Notre Dame’s Arike Ogunbowale, Reminder Enhancements closed strong to win this category at the buzzer. From the jump, the Mailroom category was a three feature race. 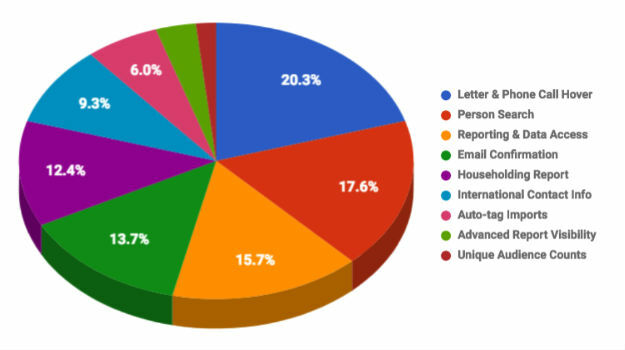 Bulk Mail Statistics jumped out to an early lead with six of the first 10 Mailroom votes. Bulk Mail kept adding votes, but slowly Additional Logging Types compiled enough votes to take the lead by the end of day 1. Last year’s second place finisher No Response was able to attract enough votes for a third place showing but, throughout the week, it was Bulk Mail and Logging Types leapfrogging each other to take the lead and give it back again. By the end, 26.4% of voters had selected Bulk Mail Statistics to earn the victory. There were two battles in the Outreach category for 2018. The first race was among the 3rd, 4th and 5th place finishers (Survey Enhancements, Form Improvement, and News & Newsletter Search respectively). The more interesting competition was for 1st place between File & Photo Management and Social Media Integration. While it was close throughout the week, Social Media Integration took the lead early in the week and steadily paced it's way to the finish line by the time voting wrapped up on Friday. One of the prominent trends from this year’s vote was parity. While a few ultimately will separate from the pack, there were three categories this year where five features earned at least 10% of the vote. The People category is the best example of this balance: only 7.9% separates the 5th place finisher (Householding Report) from the eventual winner. So there was a lot of interest in a number of different customer-suggested features, but ultimately Letter & Phone Call Hover emerged victorious. Thank you, again, for making the 4th Annual Feature Frenzy a success! Have a feature suggestion? Give us a call, hop into chat or send us an email. Maybe it will be in the 2018 Frenzy!